Surely, you cannot just dump your junk in your car’that will be incredibly unwise. Well, you must know that there are dumpsters for rent from Jux2 Dumpster Rental. Let us tell you more about our services if you plan to rent a dumpster in Minneapolis region. Whether you need one for your home or office, there are more than enough choices for everyone. Many people take on this type of project during a remodeling project or perhaps before a move. We have dumpsters of different sizes at Jux2 Dumpster Rental. Understanding roll off rentals requires some knowledge about the appropriate dumpster size to rent. Our expert team is always there to help you through the entire process. Large-sized objects, though not necessarily heavy, will still need a bigger dumpster, but if you are putting in smaller-sized stuff, like books, clothes, rugs, or even plant debris, you can go with a smaller dumpster. Give us a call at 763-333-2155 and talk to our experts about your need to find the right dumpster size. Irrespective of the project at hand, it is essential to think through all your choices for roll off rental sizes and find one that’s ideal for you. 10-15 Cubic Yard Dumpster: This small dumpster has the capacity to hold 10 cubic yards of debris. This dumpster size is also suitable for yard debris. If you are undertaking a kitchen remodeling job, or updating the floor of your bathroom, you can make use of this container as well. 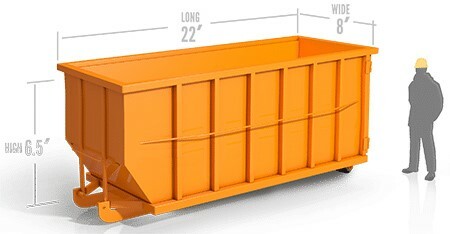 20 Cubic Yard Dumpster: This is for taking care of debris from outdoor projects or a big house remodeling job. This translates to eight pickup loads of debris. This is ideal for getting rid of larger items such as mattresses, desks, dressers, cabinets, etc. 30-40 Cubic Yard Dumpster: For bigger projects like demolition or construction jobs and roofing replacement projects, the largest containers we have on the lot, the 30-40 cubic yard dumpsters, are your safest best. Both big and small businesses have turned to Jux2 Dumpster Rental to save on roll off rentals. Dumpster rental pricing in Ramsey is not as clear as it should be. We are focused on offering you the best roll off rental container prices. If you need delivery of a 40-yard dumpster or a medium sized 20-yard dumpster, we are here to help. If a 30-yard dumpster container does not fit your job, Jux2 Dumpster Rental can still take care of your junk removal needs with one of our 10, 15, 20 or 40-yard sizes. Call 763-333-2155 today to learn more, and one of our customer service representatives will help you find the best size for your project at an affordable price. We are always ready to serve your needs. Laws and regulations pertaining to roll off rentals may differ, depending on where you are. However, it is usually the case that a permit is only required if the dumpster has to be placed on a property intended for public use. Normally, the city staff will post signs at the requested location for your dumpster container once your permit has been approved and paid for. Any dumpster container that will be blocking a public right-of-way such as a sidewalk or traffic lane will require permits. If you want to place the rented dumpster container on public property, you will have to obtain a permit. Even with a permit, you can still be fined if you park the dumpster on a public road where it is not specifically allowed. This way you can keep the dumpster on the public property without being fined. If you need a dumpster because you are making major renovations to your home, then you have likely already secured the necessary permits for the improvements you need. So long as the roll off rental company has easy access to where the trash is going to be placed, and as long as it is on private property, you most probably won’t have to get any. Then again, if the project is too big or if you require a bigger dumpster that you will have to place outside your property, then make sure to coordinate with the office that takes care of this matter so you can prepare ahead and be ready when the time comes when you will need a dumpster. To sum it all up, here are the three things you will enjoy when you choose Jux2 Dumpster Rental for your dumpster needs in Ramsey — Budget-friendly prices, more options when it comes to dumpster sizes, and of course, quality and professional services every time.